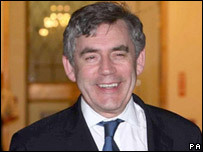 Gordon Brown has chosen one of Tony Blair's closest former aides to advise him on domestic policy when he becomes prime minister on 27 June. Jeremy Heywood was Mr Blair's principal private secretary from 1999 to 2003, and will become head of domestic policy and strategy for his successor. The Cabinet Office also announced that Jon Cunliffe will become Mr Brown's advisor on European policy. His senior foreign and defence affairs advisor will be Simon McDonald. Mr McDonald was once an ambassador to Israel and is currently head of Iraq policy at the Foreign Office, while Mr Cunliffe is currently head of international affairs at the Treasury. All three men are career civil servants and will all report directly to the Cabinet Secretary, Sir Gus O'Donnell, the Cabinet Office said. Mr Heywood, a career Treasury civil servant who once worked for Norman Lamont and Ken Clarke, played a key role managing the sometimes fraught relations between Downing Street and the Treasury when he worked with Mr Blair. He is currently working in the private sector for the investment bank, Morgan Stanley. The appointment of a civil servant who was so close to Mr Blair will be seen as one of the first signs of Mr Brown implementing his promise to form a government "of all the talents".